These farm buildings appear to have fallen on hard times, but the wheat crop looks good. The oil paint, thinned with mineral spirits, is in sealable plastic containers placed around the edge of the glass palette. I rarely pre-mix quantities of color, preferring to mix a brushload or two at a time. I think the slight color variations that result create a livelier, more painterly surface. 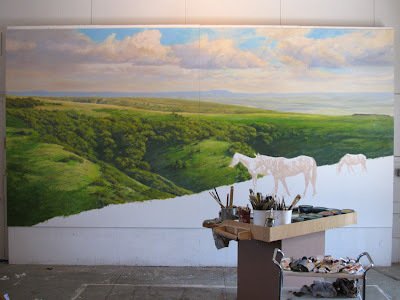 Katherine continues work in my studio on her large painting. It's fun to watch it grow in richness and complexity. Don, really great to see the blocking in here and particularly for me, the way you work with the palette. I could have carried on watching for hours and am now much clearer about your process here (what did they say - a picture paints a thousand words?) Yes, those hills are looking really rounded. The whole thing is coming along superbly. Thanks to Katherine for the filming. Really like the abstractness of the small painting today as well - good contrast with the mural! Oh, what a treat to watch you at work! Thank you Katherine! Bravo Don! I really like the way you've set up your palette. Fantastic. More! More! Hi Sheila, I appreciate your comments--thank you. Glad the video made the process clearer for you. Hey Tanner, great to hear from you! Wonderful new paintings on your blog. 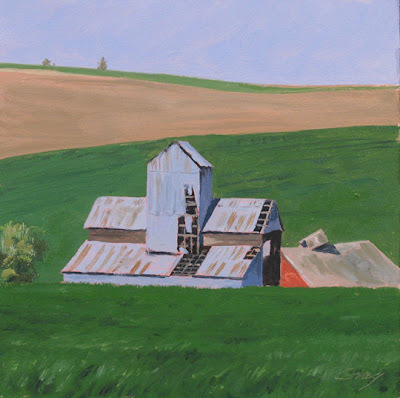 Love the farm painting. Reminds me of being young and wanting to go on the wheat harvest. Thanks, Bill. Oh to be young again, when working in the wheat harvest was a grand adventure, eh?